Plants short-stemmed, commonly suckering, trunk less than 0.5 m; rosettes not cespitose, 7-9 × 7-9 dm. Leaves spreading and arching, 50-90 × 7-12 cm; blade green, not cross-zoned, linear lanceolate, firm, adaxially guttered, abaxially slightly convex; margins straight, finely and sparsely fibrous, typically unarmed, teeth single prickles when present, 1-2 mm, 1-2+ cm apart; apical spine dark brown, subulate, 2-3 cm. Scape 2.5-3 m. Inflorescences paniculate, compact, often bulbiferous; bracts persistent, triangular, 0.5-2 cm; lateral branches 20-36, ascending, comprising distal 1/2-2/3 of inflorescence, longer than 10 cm. Flowers 15-21 per cluster, erect, 4-6 cm; perianth pale yellow, tube salverform, 10-12 × 14-17 mm, limb lobes erect, equal, 13-15 mm; stamens long-exserted; filaments inserted near top of perianth tube, erect, yellow, 3-4 cm; anthers yellow, 13-26 mm; ovary 1.5-2.5 cm, neck not constricted, 1-3 mm. Capsules not seen. Seeds unknown. 2n = 60. Flowering late spring--early summer. Sandy places along roadsides and in hammocks; 0 m; introduced; Fla.; Mexico. Agave desmettiana is an attractive and frequently cultivated plant, probably native to Sinaloa, Mexico. 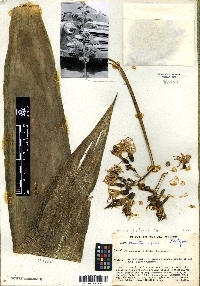 The species may be an ancient cultivar, possibly derived from A. sisalana or A. kewensis Jacobi. The plant reproduces only by vegetative means; capsules and seeds have never been seen. H. S. Gentry (1982) indicated that the plant produces a fine but weak fiber. In Mexico it is grown only as an ornamental.